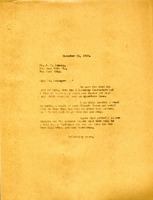 Letter to J.C. Penny from Martha Berry thanking him for his $150 donation to the schools. She also asks him when would be a good time for her visit to his Florida farms in the winter of that year. She also asks when he will be there as she would not want to visit while he was away.